Destiny 2 is a shooter MMORPG which offers players a variety of game modes, focuses on action combat and cinematic storytelling with both solo, cooperative and competitive gameplay. With multiple classes that can be customized with skills and extensive gear options, players will take them into a variety of new PVE locales to battle against all manner of enemies and bosses, or into the Crucible to battle against other players. The Red Legion, the brutal elite of the alien Cabal that is led by the fearsome commander Ghaul, has conquered the last safe city on Earth. The Guardian’s within have been removed from power and the citizens that dwelled there have fled. Now it is up to you to travel to the unexplored planets within our solar system and recover new abilities and powerful weapons. Reunite heroes scattered across the stars and fight to reclaim Humanities haven. Destiny 2 offers a fairly unique gameplay experience with players able to engage in multiple game modes as suits their preferences. At its core, the game is in many ways an MMORPG with players creating their own character, exploring multiple worlds, and engaging in exciting combat whilst advancing their skills and gear to face more challenging content. A massive action focused journey where players follow the primary story-arc as they battle against the Red Legion to try and reclaim the last safe city on Earth. With a main story and hundreds of side-missions that can be used to level up, earn gear and find out more about the lore of the setting and timeline. Strikes – Three man teams that place a group and task them with infiltrating an enemy base with the goal of eliminating all enemies within. Players can take on Strikes with their friends or use the matchmaker to find random players to group with. Clans – Extra rewards can be earned through Clan play, completing various activities with their Clan members. Clans can also be enlisted through Guided Games where solo players can utilize these organized groups to aid them in Strikes, Raids and Trials. Players can put their PVP skills to the test and battle it on in the Crucible for some 4v4 combat, battling for ranks, rewards and the prestige of being the most skilled Guardian around! Within the Crucible there are multiple PVP modes available for players to experience such as “Countdown” where one team must plant a bomb and defend it whilst the other attempts to defuse it. 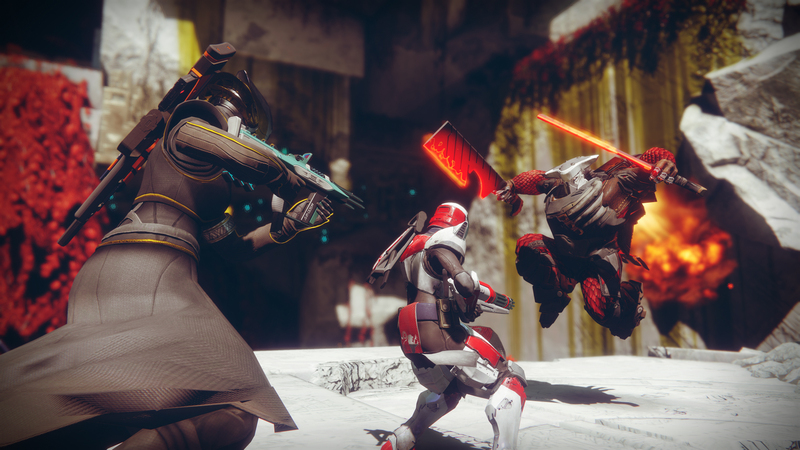 There are currently three available Guardian classes to choose from in the game: Hunters, Titans and Warlocks, each providing their own playstyle and set of skills to be used in combat. The Hunter uses both ranged weapons and melee blades, being equally deadly with either, they are agile assassins that get in and out of battle quickly and get the job done. The Titans are armored veterans that stand on the front line to protect their allies, taking the brunt of the damage and delivering it back in force until their enemies are crushed. Warlocks are followers of the Light and can use their mystic abilities to bend and warp reality to their bidding, able to help their allies and harm their foes. As players advance and grow stronger they are able to focus into various different sub-classes which focus their role and change their abilities and playstyle. As well as their skills each can harness a Super; it is not only the Warlock that can use the Light; it is a gift granted to all Guardians and they can channel it to perform a Super Ability that can have devastating effects on the battlefield.